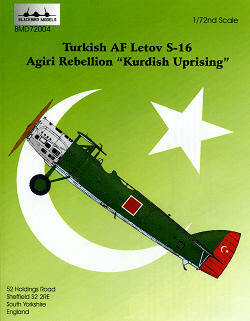 Blackbird Decals: Agiri Rebellion "Kurdish Uprising"
Instructions are very nicely done and in full color with a brief history on the back of the sheet. The decals are very nicely printed by Fantasy Printshop in the UK. The modeler will need to paint the rudder red to match the decals. For kits, there is the old but still nice KP/KoPro kit in 1/72 that will fill the bill.